Stillman Mobile App – Available for iPhone, iPad, Android and Kindle! 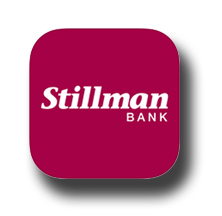 The Stillman Mobile Banking App is available for free download at the App Store, Google Play and Amazon. With the Stillman Mobile App, you can access your online accounts wherever you are! This free service makes it more convenient than ever to manage your accounts! Banking anytime, anywhere from your cell phone, tablet or other mobile device is simple with our mobile app! If you are signed up for our online account services, you are ready to go! Just go to your device’s app store to download the app. Once you’ve downloaded the app, you can access your accounts right from your mobile device! You must be a current user of online banking to access Stillman Mobile. If you’re not currently signed up for online banking, click here to get started. Wireless fees or internet access fees may apply. Contact your cell phone provider for details. Learn more about Apple Pay by clicking here.